Last week we released the first of our reporting features on the site: the Project Expense Breakdown Report. This report shows you the percentage that you spend on each of your expense categories, so you can see at a glance what the biggest costs are for you per item you make. 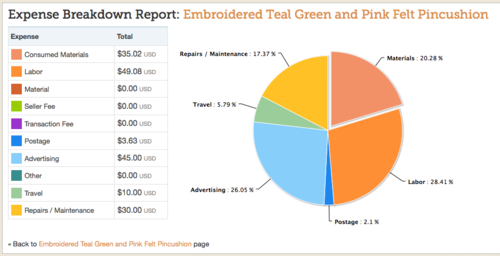 The report features a pie chart to show this information graphically, as well as a tabular breakdown of all expense totals for the project so far. You can access your project reports by navigating you your project summary page, then clicking on the Pie Chart logo under your Expenses tally section. If you have any other suggestions for reports you would like to see in Craftybase, please let us know in our Suggestions Forum!